Jordan‘s total area is around 89,000km2 and with a population of about 5 millions inhabitants. The Capital city of Jordan is Amman with population of about 1.5 million inhabitants. 80% (est.) of the total area is desert. 16% (est.) settled areas, 4% is arable land. All forest, including re-planted areas, cover less than one present of the country. 73% of the population are urban; less than 6% of the rural population is nomadic or semi nomadic. 70% of the urban population lives within 30 km of the capital city, Amman. The land that became Jordan is part of the richly historical Fertile Crescent region. Its history began around 2000 B.C., when Semitic Amorites settled around the Jordan River in the area called Canaan. Subsequent invaders and settlers included Hittites, Egyptians, Assyrians, Babylonians, Persians, Greeks, Romans, Arab Muslims, Christian Crusaders, Mameluks, Ottoman Turks, and, finally, the British. At the end of World War I, the territory now comprising Israel, Jordan, the West Bank, Gaza, and Jerusalem was awarded to the United Kingdom by the League of Nations as the mandate for Palestine and Trans Jordan. In 1922, the British divided the mandate by establishing the semiautonomous Emirate of Trans Jordan, ruled by the Hashemite Prince Abdullah, while continuing the administration of Palestine under a British High Commissioner. The mandate over Trans Jordan ended on May 22, 1946; on May 25 Jordan became fully independent from Great Britain, and has developed without interruption as the independent Hashemite Kingdom of Jordan ever since. Branches: Executive - king (chief of state), prime minister (head of government), council of ministers (cabinet). Legislative - bicameral National Assembly (appointed Senate, elected Chamber of Deputies). Judicial - civil, religious, special courts. Political parties: Wide spectrum of parties legalized in 1992. GDP (2001 est. ): $7.5 billion. Annual growth rate (2001 est. ): 4.1%. Per capita GDP (2001 est. ): $1,500. The establishment of the first institution dealing with land registration can be traced back to 1857 when the Ottoman government created Tabu (land registry offices) in Bilad Ash Sham (Greater Syria), which included Jordan. Its main task was to make a kind of land inventory for taxation purposes and for this they created what they called then Tabu books where they documented a descriptive information about the land, such as its value, owner or beneficiary (user), neighbouring owners, roads, valleys, etc. There was no real mapping or surveying process at this stage. Jordan legally remained part of the Ottoman empire until 6th Aug 1924, the date of certification of Luzanne treaty, article (139) of which entitled and enabled Trans Jordan to acquire the registers and documents related to public and private property. The government soon began re-organizing lands and properties; it issued the first by-law of land. In 1927 the Law of Land and Valuation was issued. This law implied the fixing of borders of villages, state forests and often land properties. The name of Lands Department appeared for the first time in 30/9/1929 after unifying the Surveying Department, Treasury Land Department, and Department of Land Registration. An English official was assigned by the Mandatory Government to preside it. 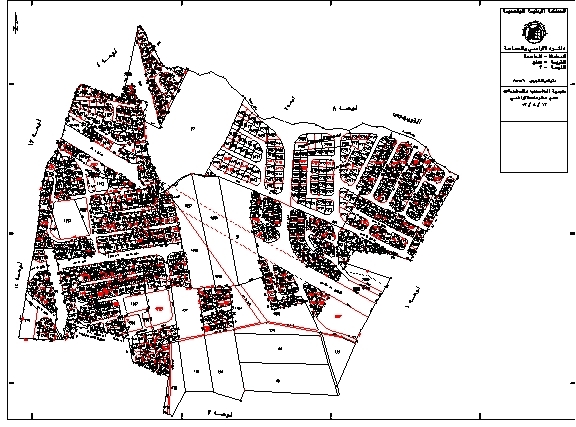 These developments marked the beginning of producing cadastral maps with 1:20000 and 1:10000 scales at first and later on other scales were used such as 1:5000, 1:2500, 1:1250, 1:1000 and even 1:500 in some dense built-up areas, and since then the cadastre and registration in Jordan are combined in one authority and both components form the cadastral system in Jordan. After unification of Trans Jordan and the west bank, the Lands and Survey Departments in both banks of river Jordan were unified, its headquarter was in Amman and it became responsible for all land registry offices throughout the country. By the year 1950 most of the rural areas were registered. In 1952 and 1953 most of the laws concerning land and water settlement (Land and water rights), registration, etc. were enacted and applied in both banks. Baseline (method) mapping was used till 1942. Plan table method was used till mid of 70s. Mapping by tacheometry till end of 80s. Mapping by using modern instruments and technology (e.g. EDM, total station, GPS) from end of 80s. 1995 marks the beginning of digitising of all old maps. it was finished by the end of 2001. By the end of 2002, all digital cadastral maps had become matched together and were built in AGIS system ( one unit seamless data ). Nowadays 100% of Jordan’s territory is mapped and more than 95% is registered. The Department of Lands and Survey (DLS) is the agency responsible for both the land registration and the cadastral surveying on a national level, with 32 land registry offices and 17 surveying groups. DLS is under the umbrella of the Ministry of Finance. The licensed surveyors (private surveyors) are involved mainly in cadastral surveying transactions like parcel subdivision, unification, boundary reestablishment etc. There is no significant involvement of the private sector in land registration aspects. The licensed Surveyors Association (LSA) was established in 1999 with 134 members and today it counts 234 members. It is important to clarify that the membership of licensed surveyor in this association is not obligatory. Licensing of surveyors is according to by-law that regulates this profession (Cadastral Surveying). The surveyor should have no less than 2 years diploma in surveying after high school and no less than 2 years practical work and 6 months of training for surveying engineers and 7 / 2 years for surveyors with 2 years diploma. All must pass an examination. There are several colleges that offer 2 years diploma in surveying and only one university that offers bachelor in Geomatics and Surveying Engineering. The annual number of university graduates is about 30 and of diploma graduates is about 56 students. The cadastral system in Jordan has both, legal and fiscal role. In addition to that the cadastral maps are used as the base for land use planning, infrastructure planning and others, but the cadastral system itself cannot be considered as multi-purpose one even though this is the ultimate goal. The cadastral system is one for the whole country. Same laws are applied for urban, rural, private owned land, state owned land etc. Land rights are obtained by applying the same laws and principles regardless of the location and use. However there are some informal settlements occupying state owned land. The cadastral concept in Jordan is based on the unity and integration of both the land registration (land title) and the cadastral surveying (maps). The main units of cadastral system are land parcels as show in the first scenario and it’s surveyed and registered on a national level. The cadastral system in Jordan embraces in itself both, the land registration and the cadastral surveying. Land register contains the names of landowners and there shares, identification numbers of parcels (unique number), areas, initial values, easements and mortgages. All maps are in digital form and land registry records are automated. The cadastral map in Jordan contains: name and code number of districts, name and code number of sub districts, name and code number of village, name and code number of block, name and code number sector, sheet number, parcel number. All of these are combined together to form what is called DLS key, which is a unique key or identifier for any parcel. Boundaries and streets lines are the spatial representation of the map. The data model is ARC/INFO coverages. Features are identified by coordinates and attributes and stored in double precision. Logical layers are administrative layers and parcels polygons layers, however by the end of this year (2003), DLS will convert all coverages to the latest version of ESRI product ArcGIS Geodatabase. The cadastral map in Jordan is used as a base map for most purposes such as utilities, transportation, developments plans and land use planning. The unique identification number for the parcel helps DLS to maintain the data incrementally and provide a lot of analysis on a national, regional and local level. The logical layers (districts, sub districts, village, block, sector, sheet-no, parcel-no) provide the basic layers for the work of most government agencies, municipalities, utilities and many private companies. The ministry of rural affaires and the greater municipality of the capital city Amman, which are responsible for the development of rural planning and zoning are relaying completely on DLS cadastral maps (expropriation transaction, roads, etc.). DLS recognizes the problem of low accuracy of its cadastral maps due to historical reasons, this causes a sort of contradiction between the physical reality on the ground and its reflection on the maps and that this situation in no way can meet or satisfy the needs of its clients, and introduced an important problem that cadastral currently is confronted with and that is boundary disputes. To raise the level and number of qualified staff and help in raising the level of the licensed surveyors as well is another challenge faces DLS. Implementing the technical specifications and standards in subdivision and boundary fixing procedures. The alternative that DLS come up with after consulting international experts on this issue (mainly German experts through GTZ) is the concept of partial resurveying. The concept strategy is to renew the cadastral maps gradually by replacing the current coordinates of the boundary points by new accurately observed and computed coordinates using the JTM projection. The gradual replacement of old coordinates with new ones means that every time when a new subdivision of a parcel is under process, a boundary reestablishment must and should precede it. This boundary reestablishment will be carried out using a uniform, precise and homogeneous geodetic network in JTM, by this the result will be a set of new computed boundary points that will automatically replace the old one and by that updating the cadastral map gradually. For that to happen smoothly and without any duplication of work in the future, the cadastral maps must be converted into JTM projection first. Of course it is not necessary to wait for a new subdivision of a parcel in order to renew and update the cadastral maps, the same procedure can be execute for all areas with big discrepancies. The best way would be to put clear and just priorities for areas to be resurveyed by taking into consideration the value, location, density, number of transaction, level of demand on accurate data, etc. This strategy forms a big challenge to DLS and in order to see to its successful implementation it needs to be accepted by and explained very clearly to all concerned stakeholders and especially the public and licensed surveyors as main executors. DLS offered and is still offering scholarships to its employees to obtain a bachelor degree in geomatics and surveying engineering and in the same time the licensed surveyors are obliged to attend training courses tackling topics such as modern surveying techniques, applying standards and technical specifications, boundary fixing administration, etc. A new bylaw for licensing surveyors has been adopted with new terms and conditions, which ensure higher level of professionalism. In its effort to improve the quality of its products and services, DLS has introduced the concept of quality assurance system ISO 9002 in mid of 2002. ISO 9002 certification was granted to the head quarter of DLS plus one pilot Land Registry Office and one fieldwork group. Now the challenge is to extend this system with its new certificate ISO 9001/2000 to all Land Registry Offices and all fieldwork groups. This task has already started and is expected to finish by the end of 2003. Technical specifications are revised and explained and their implementation by all concerned parties are strictly followed.